My Singapore stock portfolio returns (including dividends, excluding transaction costs) in 2018 was about -5.94%. I will not be updating this blog, so this will probably be my last post. Thank you for visiting and I wish every reader good health, happiness and many prosperous years ahead. Divested my remaining stake in ARA , as it concluded the share scheme in Apr 2017. Divested DairyFarm, Del Monte Pacific, Transit-Mixed Concrete and Yoma Strategic. Added Frasers Centrepoint, Keppel Corp, Kimly and Siverlake Axis to my portfolio. Adjusted my stake in some of my existing holdings. Although challenges persist in some of the companies I own, I do hope my portfolio of companies will perform satisfactorily in the long run. Based on the 7-years plan set in 2010, I did not achieve my desired asset target by 2017. I did not manage to increase my personal investable asset by 17% annually, and this is mainly due to my inability to compound my Singapore stock portfolio at a satisfactory rate. I have lowered my financial target for the next 7 years. I aim to achieve 13% increase in my personal investable asset yearly for the next 7 years. Divested Select Group – The founders and Dymon Asia Private Equity made a cash offer the company at $0.525 per share. Partial sale of ARA – The founder, major shareholders, Warburg Pincus and AVIC Trust made a general offer for ARA at $1.78 a share via a share scheme. The offer is currently ongoing. Added Dairy Farm International and SGX to my portfolio this year. Although challenges persist, I hope my portfolio of companies will perform satisfactorily in the long run. Divested Zagro – The Chairman/CEO of Zagro is seeking a voluntary delisting of the company at $0.30. Distribution in specie of shares of Boustead Projects by Boustead Singapore and its listing on SGX. Added 6 new companies to my portfolio this year (some are relatively small stakes): ARA, Boustead Projects, Fraser and Neave, Jardine Cycle & Carriage, SBS Transit and Select Group. In 2015, some companies specific issues, like BreadTalk’s Soya Bean Milk Saga, resignation of Singpost’s CEO etc. were disappointing. Divested Goodpack – KKR made a general offer for Goodpack at $2.50 a share via a share scheme. Divested Eu Yan Sang, Food Empire, SPH, Super Group and The Hour Glass. Added 5 new companies to my portfolio this year (some are relatively small stakes): 800 Super, iFAST, Raffles Medical Group, Singapore Shipping Corp, Yoma Strategic. I am satisfied with the performance of most of the companies in my portfolio this year. Although some of the companies are currently facing some challenges, I hope they will perform satisfactorily in the long run. Divested my remaining stake in F&N – TCC Asset made a final general offer for F&N at $9.55 a share. Divested CSE-Global, Parkson Retail Asia and Venture Corp.
Added 5 new companies to my portfolio this year (some are relatively small stakes): Haw Par, Micro-Mechanics, Super Group, Transit-Mixed Concrete and VICOM. 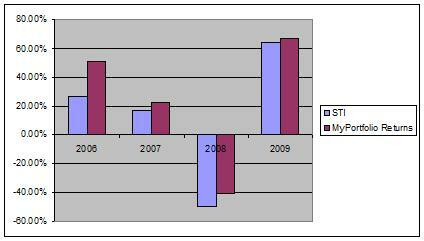 I am satisfied with the performance of the companies in my portfolio this year. Although some of the companies are facing strong headwinds currently, I hope they will perform satisfactorily in the long run. Divested Great Eastern Holding and Boardroom Limited. Divested APB – Heineken bought over the F&N’s share of APB at $53 a share, and Heineken is currently making an offer for the remaining shares in APB that it does not already own. Partial sale of F&N – General offer for F&N at $8.88 a share by TCC Asset, and subsequent offer of $9.08 a share by a consortium led OUE (supported by Kirin). Both offers are currently ongoing. Divested Cerebos Pacific – Suntory privatized the company at $6.60. Delisting of LMA – LMA disposed substantially all the Company’s assets to Teleflex, and it is paying the liquidating distributions of approximately $0.62 per share to its shareholders. Added 6 new companies (mainly mid/small caps) to my portfolio this year: Boustead Sp, Eu Yan Sang, Food Empire, Goodpack, Parkson Retail Asia and Venture Corp. Adjusted my stakes in some of my existing holdings. Zagro – Skopini/Zuellig sold all its Zagro shares to all other existing Zagro shareholders (offering 32 shares for every 100 shares, at $0.15 a share) – in exchange for the release of its non-competition undertakings. This is followed by the Chairman launching an offer for Zagro at $0.15 a share. He currently own about 60% of the company. Petra Foods is selling its entire cocoa ingredients business to Barry Callebaut for almost US$950 million to focus on its branded consumer business. Added 5 new companies (mainly mid/small caps) to my portfolio this year: BreadTalk, Del Monte Pacific, LMA, Petra Foods and Sheng Siong; increased my stake in some of my existing holdings. I am considering switching part of my portfolio to STI ETF. 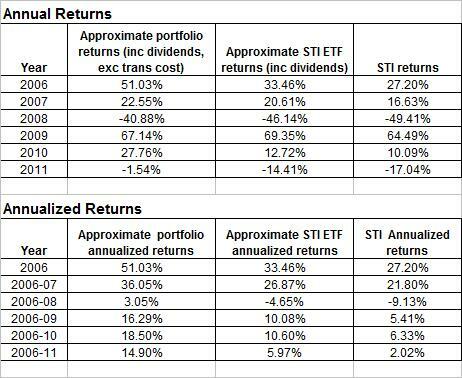 To measure the performance of the STI ETF, I calculated the approximate internal rate of returns of the STI ETF for the last 6 years, based on published/approximated NAV at the end of each year and the total dividends paid out for the year. I will not be updating my portfolio monthly from 2012 onwards. There will be a change in my work-plan next year. My financial target, regretfully, will have to be re-adjusted lower. 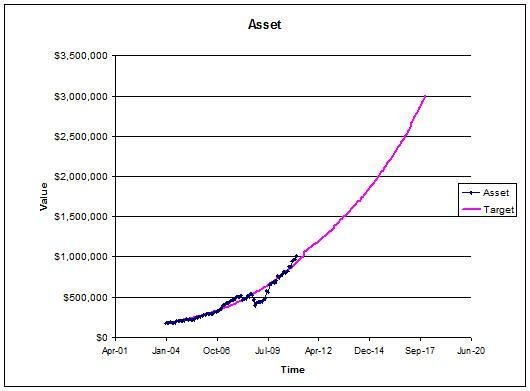 I aim to achieve 17% increase in asset yearly, hopefully (and I will not be updating the asset chart monthly from 2011 onwards).